Birthing a Mother is the first ethnography to probe the intimate experience of gestational surrogate motherhood. In this beautifully written and insightful book, Elly Teman shows how surrogates and intended mothers carefully negotiate their cooperative endeavor. 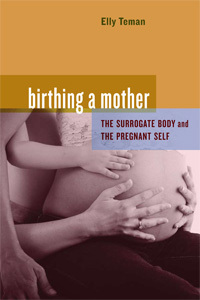 Drawing on anthropological fieldwork among Jewish Israeli women, interspersed with cross-cultural perspectives of surrogacy in the global context, Teman traces the processes by which surrogates relinquish any maternal claim to the baby even as intended mothers accomplish a complicated transition to motherhood. Teman's groundbreaking analysis reveals that as surrogates psychologically and emotionally disengage from the fetus they carry, they develop a profound and lasting bond with the intended mother. Elly Teman is a Research Fellow at the Penn Center for the Integration of Genetic Healthcare Technologies at the University of Pennsylvania.